T3 Agenda: Google's energy-harvesting walkway shines bright. Ego's lithium-ion-powered leaf blower. And more! 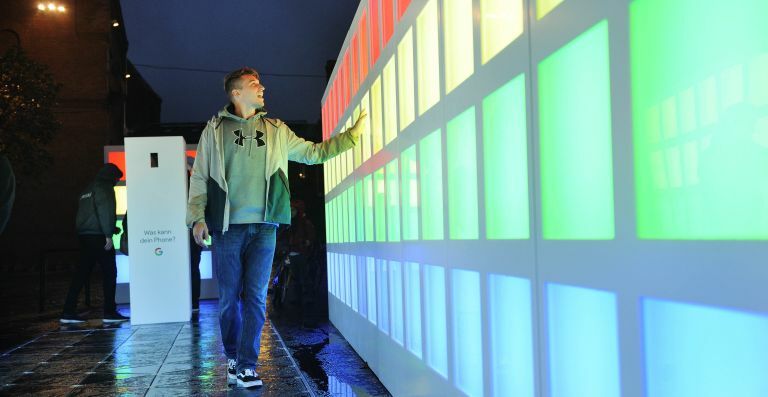 To celebrate Berlin’s Festival of Light, Google has partnered with data harvesting firm Pavegen to build the largest ever energy-harvesting walkway. The footsteps of visitors to the world’s largest single energy harvesting array are being converted into off-grid electrical energy to trigger a synchronised lighting display and generate videos recording their experiences. The record-breaking 26-square metre installation can be found at KulturBrauerei, with its 100 electro-magnetic generators converting the kinetic energy so it can trigger 176 coloured light panels surrounding users (as well as providing data on the energy generated). Ego has unveiled a new leaf blower that drops a traditional petrol engine in favour of a far more energy efficient lithium-ion battery. The LB5750E EGO Power+ leaf blower will retail for £219 (including 2Ah battery and standard charger) or £149 without these accessories. The LB5750E blower features Ego’s supreme high-efficiency brushless motor that delivers more power and a greater runtime than rival models, alongside a lightweight, compact design. It also boasts a large diameter blower tube for maximum airflow, generating a maximum air volume of 977m3/h, and an air speed of 212 km/h that shifts even the most stubborn leaves and debris. Roku will launch two of its latest steaming players, the Roku Express and the Roku Streaming Stick+, next week on 18 October. The former is the latest version of the Express model and is five times more powerful than the previous version. It comes with everything in the box to get started including simple-to-use remote and HDMI cable and will retail for £34.99. The Roku Streaming Stick+ features a new remote control and boasts a quad-core processor and exceptional wireless performance (offering up to four times the wireless range to minimise buffering). It's also ideal for HD, 4K and 4K HDR up to 60 fps. The Roku Streaming Stick+ will cost £79.99. Are you a budding Twitch streamer, podcaster or YouTuber? Looking to upgrade your audio setup? M-Audio has just the condenser mic for you. The new M-Audio M-Track Uber Mic comes with four selectable polar patterns, USB/direct mixing control, internal headphone amp and LCD display that's perfect for recording music, podcasts and broadcasting. So whether it's recording instruments and vocals, doing podcasts / broadcasting, or bringing the gaming experience to the next level, the M-Audio Uber Mic does it all. The M-Audio M-Track Uber Mic will be available later this year for £89.99.